New bike lanes are being installed as part of Salina’s Bicycle Master Plan implementation, along with forthcoming sharrows and multi-use paths. The 2015 edition of the Kandango bicycle tour features a new route on the back roads of central Kansas, with new overnight stops, transportation, and entertainment options. 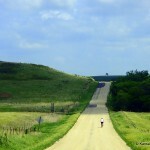 A ride report and photos from the 2014 edition of the Kandango bicycle tour through the Smoky Hills and Flint Hills regions of central Kansas. Accused Killer Ordered To Stand Trial in Salina; Pittsburg Scouts Honored for Cycling; Promoting safe bicycling in KCK; Topeka Bikeway Signs Installed; and more bicycling news from Kansas and neighboring states. Flint Hills Nature Trail Reopens, Salina Trial Postponed, Top City Cranksgiving, Topeka Bike/Ped Bridge Proposed, and more bicycling news from around the state and the region. Lewis Grider, the man accused of the hit-and-run death of bicyclist Gail Kline on May 31st near Salina, goes on trial November 15th, facing charges of reckless involuntary manslaughter, leaving the scene of an injury or fatal accident, and failing to report an accident. RANS Celebrates 40 years on 2 wheels, Salina Hit-and-Run Killer Faces Preliminary Hearing Nov. 15, Take a Kid Mountain Biking Day is October 5th, and more bicycling news from Kansas and neighboring states. Charges filed in fatal Salina hit and run, No Charges in Lawrence Bicycling Fatality, Hays Bike Lanes Being Installed, Midwest Bicycle Fest, and more bicycling news and events from Kansas and nearby states. 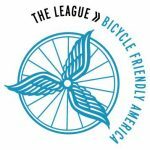 Tour of Lawrence, New Lawrence Bike Racks, Pittsburg TransAm Shelterhouse Ribbon-Cutting, New York bicyclist struck by car near Tribune, and more bicycling news from Kansas and nearby states.